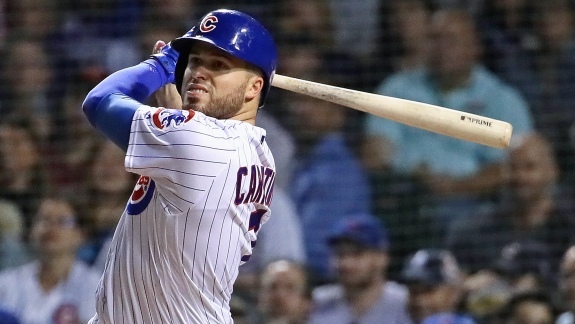 On Tuesday night, Victor Caratini belted an RBI double to left field during the seventh inning to lead the Chicago Cubs to a 3-0 win over the Milwaukee Brewers. Tonight, the Milwaukee Brewers (83-63, .568) and Chicago Cubs (84-60, .583) will face each other for the final time during the 2018 regular season. After beating the Cubs on Monday night, the Brewers inched to within one game of the National League Central lead. But on Tuesday, the Cubs answered with a 3-0 win to extend their lead to two games. The outcome of tonight's game will determine which team wins the series and if the Brewers have a chance to catch the Cubs and win the division, or if they will focus on securing one of two National League wild card berths. Milwaukee will start 30-year-old Chase Anderson (9-7, 3.95 ERA) to the mound. During his last three starts, he lasted exactly five innings in each outing and compiled a 1-0 record. The Cubs counter with 28-year-old Kyle Hendricks (11-10, 3.71 ERA). Hendricks was 2-0 during his last three starters and only allowed two earned runs. Looking ahead, the Cubs only hold a two-game lead over the Brewers entering action this evening. A Brewers win would chop the Cubs' lead back to one game, but a loss would push them back to three games. The St. Louis Cardinals (81-64, .559) sit in third place only 3 1/2 games behind the Cubs. If the season ended today, the Brewers would host the National League Wild Card Game against the Cardinals in Milwaukee's Miller Park.